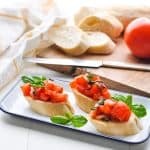 Bruschetta is a simple appetizer or side dish takes advantage of our garden’s bounty by combining bright red, ripe tomatoes with fresh herbs, garlic, olive oil, and vinegar! Toast bread slices by brushing one side with olive oil, then broiling, non-oiled side up, for 45 seconds or until toasted. Turn bread over, add grated Parmesan cheese, and toast until lightly browned. Set aside and allow bread to cool. In a small bowl, combine basil, garlic, oregano, balsamic vinegar, olive oil, and lemon juice. Set aside. No more than 2 hours before serving, slice tomatoes into 4 sections, remove seeds, and chop coarsely. Combine tomatoes with the herb mixture and season with salt and pepper, to taste. No more than 10 minutes before serving, top each bread slice with about 2 tablespoons of tomato mixture.